If you were to walk into a Victorian-era home, one of the dominant decorating themes you would see is flowers. They were everywhere—woven into the rugs, stitched into the upholstery, painted on the wallpaper, even carved into the furniture. Given this trend, it’s no wonder that in the 1800s one of the most popular hobbies among women was flower pressing. In my latest release, To Win Her Heart, I have a heroine who is passionate about this pastime. Eden adores flowers and loves to preserve them by pressing them and then turni ng them into framed works of art. However, she is cursed with a black thumb—she kills every domesticated plant she tries to grow. Therefore, her only recourse is to collect clippings from the wildflowers that bloom naturally throughout the spring and summer near her home in Spencer, Texas. Some women pressed flowers for sentimental reasons. If a beau gave them a blossom, they might press it between the pages of a favorite novel or volume of poetry. If a young boy gave his mother a daisy, she might slip it between the pages of the family Bible. The color from the petals would often bleed onto the book’s pages leaving an imprint even if the flower was removed. Today, if you shop for antique books, you might come across a volume with these markings or even the flower itself still pressed between the pages. The serious Victorian hobbyist, however, would harvest her flowers with a field press in hand, so she could press them immediately. This helped preserve the vibrancy of the colors. She would go out late enough in the day to ensure the dew had dried, since moisture in the petals could create unattractive dark spots or worse, mold in the press. Flat, simple flowers work best. If the flower was too thick, it wouldn’t press properly. Pansies, daisies, bluebells, and violets worked exceptionally well with their single-layer petals. Ferns, leaves, and interesting grasses were often pressed as well and used as te xturing in the artwork. The flower press was usually made of wood, and the young lady would layer blotting paper beneath and above her flowers to absorb all the moisture. Some presses would have an iron top that could be tightened with a crank-like handle. Others, though, would be held together with leather straps. Eden used the strap variety. After the flowers had been pressed, they could be stored in paper packets for later use. Once enough had been collected and dried, the flowers could be arranged on silk, lace, velvet, or other background fabric and then framed under glass for a keepsake that could be proudly displayed on a parlor or bedroom wall. So have any of you preserved flowers in a book or a press? Have you ever found a pressed flower in an old book and wondered about the story behind it? ~Karen Witemeyer, who recently took her daughter on a wildflower hunt for a science project and pressed some purple verbena and tiny Blackfoot daisies in a dictionary. This wildflower excursion happened to take place on the same day she found out that her debut novel, A Tailor-Made Bride, was named a RITA finalist in the Best First Book category. A great day all around! A blacksmith with a criminal past. A librarian with pacifist ideals. Do they have a fighting chance at finding love? I have a neighbor who has a beautiful flower garden. She and her daughter make dried flower arrangements. She also makes gorgeous pressed flower cards which she sells. I love both and have bought several of her items. I also bought at Target some pretty pressed flower note cards which were made by a company in Wisconsin. Love them. I pressed leaves with my daughter when she was in grade school. I have never tried to press flowers. Best of luck with your book. I’d love to read Levi and Eden’s story! Have just joined a garden club, hoping to turn my black thumb green. Perhaps, Win Her Heart is the better hope. Hello, Karen! 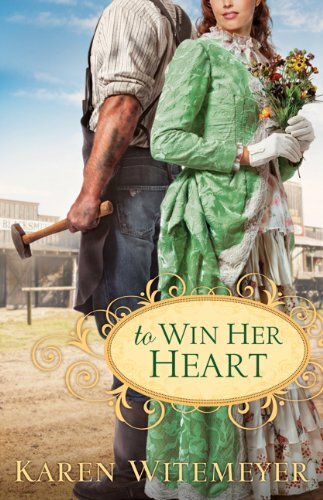 How delightful to read the word “beau” and think of all it connotates : ) The story line for “To Win Her Heart” sounds wonderful, and the characters are charming! Even though I have lived in a very small town for most of my life, I never tire of “small town” romances. Small towns sometimes hold big secrets! People are very interconnected. What happens to one person affects someone else, and the ripple effect is started. However, there is an essential sweetness to small towns. Memories of earlier days, some bittersweet, are held dear. People aren’t just faces, they’re family and friends. My favorite Summer memories are of the times I spent with my grandparents working in our garden. My grandfather was a natural “master gardener”. He grew the best tomatoes that I have ever tasted! One of a Southerner’s favorite meals is a slice of juicy, ripe homegrown tomato on a fresh, hot butter biscuit! We grew both vegetables and flowers. My grandmother was the best cook ever, and she cooked and canned wonderful foods that we grew and harvested from our own garden. Gran and I would also go on “nature walks”. She knew the name of just about every flower and plant along the way. One day she had me smell the leaves of a low-growing plant–Teaberry–just like the chewing gum! It smelled wonderful, and it made my mouth water! Gran was also skilled with a needle, and she embroidered many household linens with pansies, violets, and her favorite lilies of the valley. She also pressed flowers, and occasionally I will still come across flowers she has saved between the pages of an old book or tucked in a vintage greeting card. One of my cousins was very artistic, and she used a flower press to create wonderful works of art. Liz – Good luck with that thumb transformation! Let me know if it works. I might have to try similar therapy. Of course, it’s hard to have a successful garden when I’d rather be indoors reading. Hi, Vickie – I wish that I had known more about drying and pressing flowers when I got married. I would love to have a keepsake from my bouquet tucked away in a special book somewhere. Maybe I can try when my daughter gets married. Although, she’s only 13, so that won’t be for YEARS. Hopefully. I have pressed flowers too. But probably not the right way. Just between pages of a heavy book. I don’t really like to work outside in the heat, but my in-laws can grow anything. My husband too. To Win Her Heart sounds really good. Looking forward to reading it. Hi, Patsy. Thanks for sharing. I am definitely an amateaur, too. I enjoy the beauty from gardens that other people cultivate more than my own. But I do have a few potted flowers and a small bed along the side of the house. Of course, that flower bed is full of grass and weeds right now, but a few brave bulbs are sprouting their leaves despite my neglect. Hooray for nature finding a way! I’ve helped my mom put flowers and I’ve done a few leaves– we just put them in some paper and put them in books. I actually love to garden– planting veggies, flowers, and other things. The book looks really good! Thanks, Amy. I hope your garden does well this year. It’s been so dry in Texas this spring that the wildflowers have suffered. Not as many bluebonnets this year, and they seemed to fade more quickly than in years past. But there are other hearty flowers making an appearance along the roadways that are just as pretty. Hope your garden does well this year! I have been inspired to try this myself! Karen, I loved this post. What an interesting topic. An artist in Montana presses wildflowers and then frames them in old window frames. I’ve always loved how these look, and when my dad tore down our old playhouse I kept the window frame with hopes to do the same. Thanks for sharing and “To Win Her Heart” sounds like a wonderful read. Karen- I try and send the rain from Oregon to Texas…we’ve been getting lots of rain. That is sad about the bluebonnets. I enjoyed reading your post! I didn’t realize it was such a popular hobby among women in the 1800’s. I remember pressing a few flowers as a teenager among the pages of a book. My Mother who is seventy-six yrs. old still has pressed flowers, although they are pretty fragile now. Your book “To Win Her Heart” sounds like a book I would love to read. I will look foreward to it!!! Your book cover is so pretty! Hi Karen, great post. I have found flowers pressed in books after many years, most of the time in my bible. Sometimes it even hard to remember where the flowers came from. I have always wanted to learn how to press flowers. Your book sounds like a great story. Cheryl C. – Good luck with your flower pressing. Now is the perfect time of year to give it a try. Enjoy! Amy M. – Yes, please send us some of your rain. We need it! I have family in Eugene. It is always so green and lush up there. Kristen – What a great idea to keep that old window frame! That would make a lovely piece, and so sentimental too, tied in to your childhood. Sharon – How wonderful to find those old pressed flowers! I hope you enjoy Levi and Eden’s story. Hi, Quilt Lady – How fun to find flowers in your Bible! Even if you can’t always remember why you chose to save them, you can have fun making up a romantic tale in your imagination. Sometimes those are more fun anyway! Rebekah – I hope you give flower pressing a try. And thanks for stopping by today. Colleen – What a wonderful memory to preserve! Graduation is such a pivotal time in a young woman’s life. So glad you kept those flowers! Melinda – Glad to see you here at the Junction! I hope you enjoy Levi and Eden’s story! Blessings! I absolutly love this post. I have both dried and pressed flowers and find it fasinating. I did find a violet that my husband”s grandmother had pressed into a book that I had rescued from being destroyed after her death. I placed thius beautiful flower into a frame and would love to know why it was important to her. Have pressed flowers from proms and wedding bouquets for my daughters. Have never found pressed flowers in old books, but would love to. I remember pressing flowers as a kid. I’d open them later and it seemed like a wonder to me that it was so perfect….flat but perfect…the color, the delicasy. The book sound wonderful, karen. I have it in my hot little hands right now. I can’t wait to get to it. Are you coming to RWA? Maybe we can get together. I’ve tried pressing flowers I’ve received before and they didn’t do to well. I also tried drying them and I guess I just didn’t do it right. I envy those people with green thumbs. I have pressed flowers before and put them in frames under glass. They make nice wall decorations. Now you have me wondering where my flower press is? I’ve mostly used it to press wild flowers to put in a notebook I use to help my kids identify the few wildflowers we have in our area. Both my mom and my mother-in-law kept flowers with special memories pressed in their Bibles and special books. Hi, Connie. What a wonderful keepsake! I’m so glad you rescued it and have it displayed for you husband and everyone to enjoy. Maybe you can imagine a story to go with the flower. A gift from her husband, her son? It would be fun to imagine. Hi, Estella. I bet your daughters will be so thankful to have those memories preserved. I wish I had thought to that for myself. Hi, Mary. It’s amazing, isn’t it, how perfect those little blooms can look. I’m eagerly waiting to get my hands on your newest. It can’t come soon enough! I won’t make it to RWA this year. The trip to New York was just too expensive for the budget. I’ll be at ACFW for sure, though. I’ll look forward to seeing you there! Hi, Linda. Certain flowers press better than others. Thick flowers like roses don’t press well, while thinner flowers like daisies, do, because they flatten so easily. If you decide to try it again, you might pick a thin flower and see if it works better for you. Best of luck! Joye – You remind me a lot of my heroine. Not so good with the live plants, but loves to create art from them once they have been pressed. You and Eden will get along very well, I’m sure. Karen, sorry I was out of town on your blog day. Shoot! I wanted to tell everyone how great your books are. You’ve become one of my favorite authors. Congratulations on being a RITA finalist for the Best First Book category. I can see why it got the nomination. Wow! I loved The Tailor-Made Bride. Good luck to you and best wishes. Your books are wonderful, Karen, and I can’t wait to read this one!!! Hi, Linda – You are such a sweetie! Your support and friendship mean so much. The Junction just wouldn’t be the same without you! Melissa – What a wonderful way to have stories told to you about your grandmother – through flowers! Thanks so much for sharing that. Fabulous! I have a flower press and have used it and books to press flowers and leaves. I have done flower pressing with my scout groups and as part of a program on Lewis and Clark at the library. I collect old books and have purchased several with flowers between their pages. Your book strikes close to home. I am the pacifist librarian and my husband a military man who is now into blacksmithing as a hobby, as is our son. Don’t live in Texas though. I’ll be looking for TO WIN HER HEART. Good luck with its release.